Earlier we told you the inspiring, life-changing story of the Best Craigslist Car Ad Ever, and many of you saw the ad, and had your lives changed forever. Since the article posted, we've been getting the ad sent to our tips line nonstop. Clearly, this is a Big Deal. We wanted to know who to thank for this massive improvement in life on Earth, so we tracked down Joe Strachila, 23, and his longtime friend who actually made the ad, Kyle Miller (also 23). Joe's an aerospace engineer, and Kyle's (not surprisingly) in marketing. They've known each other since kindergarten, which makes perfect sense. Something like this can only be born out of a union of profound, pure brotherly love. Let's hear what they have to say, and possibly inscribe it on some stone tablets or something. Jalopnik: Hello, Joe. Let's get right to it. The big question everyone has is why in God's name would you want to sell this car? Joe: I feel like it's my duty to pass on the car to someone else. It's quite powerful, and I've had it for about seven years now, so I think it's time to spread this manliness to someone else, have them beat off a bunch of women, and, you know, enjoy growing foot-long beards and whatnot. Jalopnik: It's a beautiful thing that you're able to do that. How has the car changed your life since you've had it? Joe: Oh, it's changed my life immensely. Whereas before, I was sitting on the side of the road, begging for change, man. This car pretty much fell in my lap, I was in high school. It started going up from there. Then, I graduated, graduated college, got an great job, and my luck with the ladies has been excellent. Jalopnik: And you credit the car for most of this success in life? Jalopnik: Do you have any trepidation about moving on in life without the car? Joe: The car has taught me a lot. No one can learn everything the car has to offer, but I felt it was time to share. Jalopnik: Again, that's beautiful. When you asked Kyle to come up with the ad, did you give him any direction? Joe: I gave him no direction at all. He's quite familiar with the car, having been in it many times. Jalopnik: How surprised are you by all the attention your ad for a used Pontiac with a blown head gasket is getting you? Joe: It's absolutely ridiculous. I don't even know what to think. Jalopnik: Have you actually sold the car? Joe: Not yet. I'm actually sifting through tons of voicemails, texts, and emails from people who are fans of the ad and trying to find the ones from people who actually want to buy the car. Jalopnik: Has anyone offered substantially more than what you asked now that the car's awesomeness is public knowledge? Joe: Not yet. I'm still waiting for that. Jalopnik: We heard one guy offered $10 grand— is that true? Joe: Yeah, I think I saw that. I don't really believe it. Jalopnik: Now that you have the Internet's ear, is there anything you'd like to say? Joe: I just have to let everyone know to keep looking for that perfect car. And grow a beard if you can; if you can't the right car will help you grow a beard. Sage advice. Next we spoke with Kyle Miller, the brains and hands behind the ad. Jalopnik: Have you seen the story we ran and the comments? Kyle: I have seen it, and have been going through the comments. I'm completely blown away by how much attention this is getting. It's both hilarious and entirely unnecessary. But awesome nonetheless. Jalopnik: That's pretty much how the internet works. Kyle: I know! In fact, when you called me, I was listening to someone doing a dramatic reading of the text of the ad. He put good music behind it, too. Jalopnik: We've been getting it submitted to us nonstop. How does it feel to have made the Internet happy? Kyle: Yeah, I am pretty happy it's making so many people laugh. I'm seeing it a lot on Facebook, and I'm proud of it. I thought it was funny, and I never really thought it would get this far. Jalopnik: What do you do? Kyle: I won't go into specifics, as I have to protect my company from the blasphemy that's been blasted all over the Internet, I'm not a designer per se, but it is part of what I do. I do logos and ads for my friends. Kyle: So Joe came to me initially, and told me he 's thinking of selling the car, and of course I said to him "why the hell would you do that?" That's like selling a unicorn— why do you think there's a unicorn on the ad? But he's got a new job, he's making good money, he's going to buy a new car. And I'm like, okay, you're not going to get anything close to the car, but you can try. So he asks if I'll help detail the car so it can get sold, and I'm like "sure." So then, about a week later the car, from sheer manliness, blew a head gasket. There's a big misconception online that the car doesn't run— it does run, just not over 3000 rpm. Jalopnik: Why would you want any more? If it goes by too fast, who could appreciate its glory? Kyle: Exactly. So he came to me after that day, and said we're just going to put it out there, and it'll sell one way or another. So about two hours after he put it on Craigslist, he came to me and asked if I'd make an ad. I knocked it out in a couple hours, and the rest is history. Jalopnik: When making the ad, did you pick things you knew the Internet goes bonkers over, like unicorns and beards? Or were they things you felt personally strong about? Kyle: I thought the key was the blasphemy, because the Internet loves blasphemy. Keep in mind I never thought it would get this big. And, yes, the Internet loves unicorns, almost in a weird way. I think of everything, it was probably the unicorn that really did it. If there was no unicorn in there, I don't think I'd be talking to you right now. Jalopnik: So, what are you taking away from all this? Kyle: At the end of the day, you never know what's going to make you famous on the Internet. I never thought my friends 1995 teal Pontiac Grand Am GT, GT mind you, would be the reason people are talking about me online. Jalopnik: In your company, shouldn't this be all you need to get any promotion you want? Kyle: Oh, I'm sure my value as an employee went up by about 100 grand. Until my star falls in about four hours, when I'll be back out on the street. Jalopnik: Now's the time to make your move! 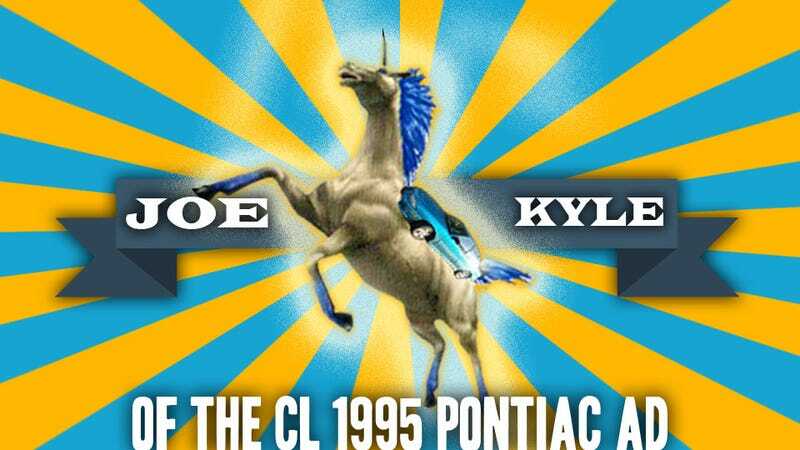 Thanks, Joe and Kyle, for showing us the aching beauty of your Pontiac. Enjoy your Internet fame– but remember, with great temporary power comes great temporary responsibility.